I am so excited, wow, we are at # 136, that is quite a few Table Tops. Can't wait to see what you have for today. We had so many fabulous entries last week. It was next to impossible to pick what to feature. I tried to pick some of the newbie's and some that havn't been featured before. You guys are all amazing. 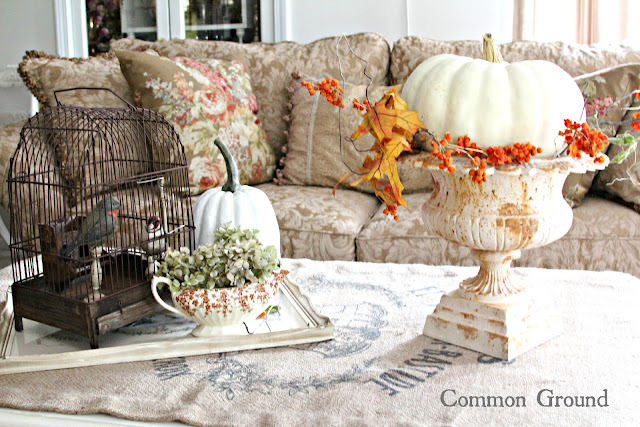 Debra at Common Ground created this vignette on her coffee table. Love that pumpkin on the urn. We've seen all kinds of pumpkins everyone has been creating, but I just loved this one done in Toile made by Pine Cones and Acorns. One More Time put this fabulous display together. Gorgeous, what a great way to use a cornucopia. Creative Country Mom's Garden decorated her porch with all of these wonderful antiques. How fun is this. Crystal Grandeur created a beautiful vignette for fall and her pictures are stunning. She is also a newbie blogger, so go by and say hello. Our Home Away From Home has made her porch so warm and inviting. You have to see all of her pics, so much detail you can't see it all in one pic. Gorgeous. Wings of Eagles put together the most lush garland for her mantel. Love the use of the fruit with the pumpkins. Stunning. Daisy Mae Belle has also created a fall porch that you just want to curl up on, and you have to see how she updated a pillow for the season. Hickory Trail put together this lovely tablescape for her gorgeous dining room. She is also a newbie blogger, so be sure to say hi and welcome. There are always so many that trying to choose what to feature is such a chore. I wish I could show them all and if you missed any, be sure to check them all out. So worth the time. Don't forget that next week we will be having our Fall Cloche Party instead of Table Top Tuesday, so get those cloches all ready. Fantastic features Marty! Thanks for the party. Looking forward to the Fall cloche party. So glad to be back this week. Thanks for hosting, Marty. Toile pumpkins! That's the best ever! Thanks for hosting Marty! Fantastic features this week, Marty! Thanks for hosting! you do a wonderful job of highlighting different blogs. Just wanted to say thanks for all your work on the blog party. Marty, these are great features! Thanks so much for hosting each week! Thank you for hosting, Marty. Loved the toile pumpkin feature. Lovin' those antiques on Creative Country Mom's porch. Thanks for hosting! Wonderful features, Marty! Thanks for hosting and have a great week. Great features Marty! Can't wait for the cloche party! Great features that you chose Marty. So sweet of you to feature newbies or those who haven't been featured. Thank you for hosting! Wonderful fall inspiration in these features, Marty. Thank you for hosting this fun party. Thanks for hosting! Comment keeps disappearing. Thanks for the fun party Marty, have a wonderful week! Thanks so much for hosting such a fun party! Have a great week! I love how you share some of the posts I may have missed! Thank you for hosting Marty, as always. Thanks bunches for hosting again this week! I am in with one I started last Spring - Ooops! Gorgeous features, I loved them all!! 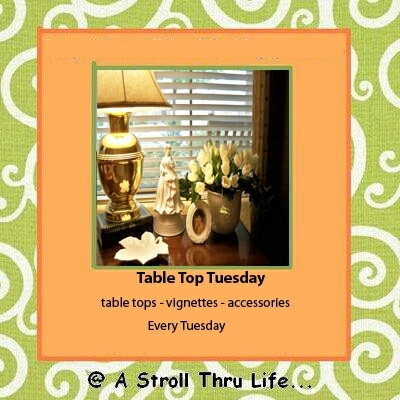 Thank you for hosting yet, another great party at Table Top Tuesday. Have a wonderful week. Marty, thank you so much for the feature!!! So happy you like my porch! And thank you also for hosting this fabulous party every week! Great features Marty! Thanks so much for hosting! Lots of fun and beautiful inspiration in these features! Thank you for hosting and have a fantastic day! Thanks for hosting. Have a great party! What a great feature photo for Debra! She always does such a great job! Thank you kindly for hosting... I'll have to come up with a fall cloche for next week! Such a nice assorment of features this week! Thank you for hosting this fun party! Thank you Marty for hosting all the creativity and inspiration week after week. We adore you for it, and for highlighting some of the newbies for us to meet. Thanks for hosting, Marty~ I finally did a second post to join in. I don't like posting the same thing I did for Let's Dish. I saw fabric pumpkins today at Hobby Lobby that were similar like the ones on your header. I resisted...today. Thanks for hosting. Hi, Marty. So glad to be partying with you this week. Thank you! Hi ya Marty! I'm jumping in a little late. :) LOOOOOONG Day. Thanks for all the great inspiration and hosting every week. Thanks so much for hosting Marty, love the toile pumpkin. Wonderful featured posts - I can see how it is so difficult to choose - so much talent out there it is amazing! Thanks again for hosting a wonderful linky party, Marty! You always inspire us, Marty. It's amazing what folks are coming up with now for Fall decor. It's just gorgeous. I come to you to be inspired about my coffee table. It's my biggest problem. I have lots, but that is the worst. Your coffee table is always fantastic!! 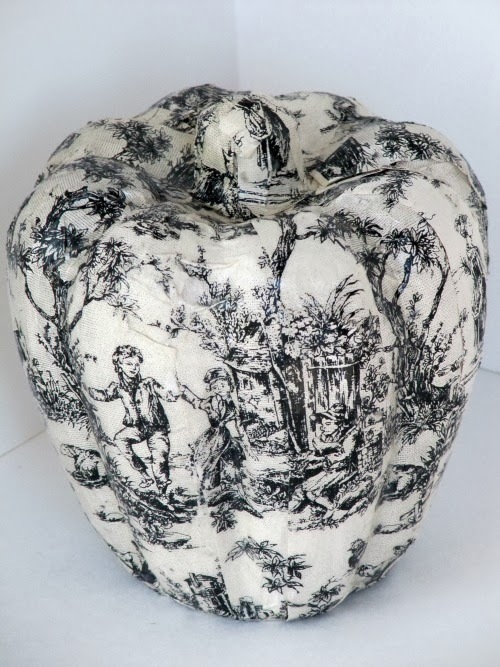 I loved the toile pumpkin too. It's amazing and so different! Marty...thank you so much for the feature on my pumpkins...I Love all the features. Thank you for hosting. Marty, I'm so glad to be here today! It's been a while since I've been able to join you for TTT--and I've missed being here! 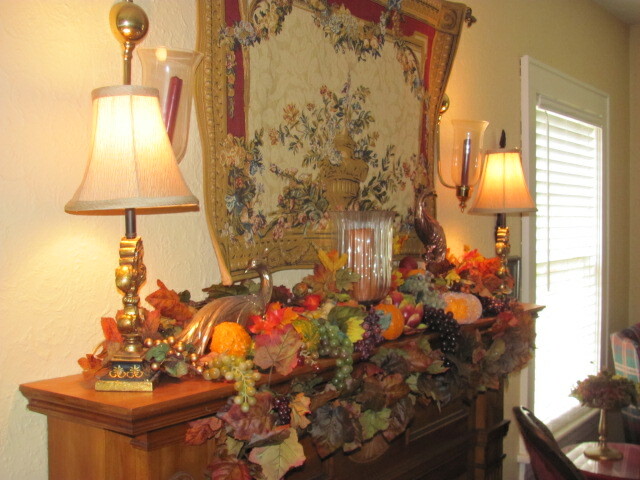 But I finally got all my fall decorating done, so I'm linking up a post about my various tablescapes. They're all pretty simple this year--much simpler than in the past. Not sure why I've been drawn to such simple looks this fall; maybe my life has just been a little too complicated! Anyway, I'm happy to be here with you. Thanks so much for hosting! Gorgeous Fall decorations. It's such a pleasure to so many different styles. Thanks for hosting. You did a very good job of picking blogs as always, know that must be very hard. Nice that you pick some new bloggers to help them get started well. I loved that pumpkin in the urn too. so elegant looking. Thanks for hosting as always, it makes for a fun time for us. Marty, Always love looking at your feature picks for the week. So many creative posts. Love the fall projects. Thanks for hosting a great party! Marty, love your Job, you did great!